With the successful Chinese version of Pop Idol and the massive popularity of singing competitions going back to the earliest days of China’s pop music industry, it was really only a matter of time before The Voice, that massive superstar-laden singing competition, hit China. 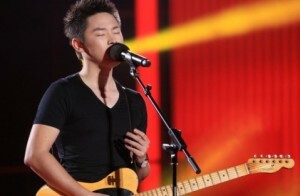 The Voice China (中国好声音)’s first season ran from July to October of 2012; season two kicks off this summer. With the American version’s debut earlier this week, why not look back at China’s version’s first season, right? The show’s first winner, named on the eve of the nation’s Oct 1 birthday, was Liang Bo. There is yaogun here, I swear. Though you could watch 251 minutes of the first series here, I’ll fast-forward to the yaogunny highlight: As part of the training process, Liang Bo’s coach, pop songstress Na Ying, takes him to meet Cui Jian, he the first and biggest name in yaogun. It’s not entirely evident that Liang is happy to meet the man, or that Cui is overjoyed at his role, because both seem to share perpetual pokerfacedness. The clip of the meeting is brief, lasting barely a minute. Liang professes, in an interview recorded later, that he grew up listening to Cui, and was happy to meet him and respects his attitude, which has remained the same throughout his career. He even sings a song for Teacher Cui, as he (and many others) refers to him. Cui is shown, briefly, smiling and saying “break a leg” (‘add oil’ is the Chinese equivalent), and even stoic Liang cracks a smile. But the point, as always, isn’t in the content of the meeting, but, rather, in the idea that someone hoping to be a star might benefit from meeting Cui Jian. Liang’s final number in the competition was “I Love You, China.” Not, perhaps, the most rock and roll sounding of songs. Though it was written by a guy who came up in yaogun’s nineties and today is generally seen as more popper than yaogunner (though he’s got plenty of yaogun in him), Wang Feng. Wang Feng’s ballad is different, one hastens to add, from the more operatic and Party-friendly song of the same name. And another contestant earlier in the competition, Ping An, went for the latter, but it didn’t get him very far. Liang adds a bit more rock to Wang Feng’s tune, though more on the Bryan Adams tip rather than in, say, inna Cui Jian style. Liang is holding a guitar, to be sure, and there is a bit of rock in there. But perhaps the most rock and roll thing occurs at the end of the song. While coach Na whoops it up on her feet atop her throne, Liang is mellow, stoic even – a situation that the host notices, asking Liang about whether he shouldn’t be a bit more happy. Liang then says he’d like to just say one thing: “I’m going to work hard,” he almost whispers, “to really give everyone a chance to hear a song I’ve written.” He is genuine and he is serious, and he might have even been poking at the show’s concept by his use of the word “really.” You almost want to root for him, despite knowing the road ahead is paved with contract clauses that would be ridiculous and downright evil were they not the industry standard. And then there’s the fury of an audience watching the show on the eve of China’s sixty-third birthday, who saw, in Liang’s win with a patriotic song, an attempt to whitewash recent events – events culminating in the expulsion of former chief of the Communist Party for the megalopolis of Chongqing, Bo Xilai, from the Party amidst nation-rocking scandal. Given Liang’s emotionally-blank appearance and his obviously intense desire to give audiences, sometime in the future, something of his own, we could well see his pseudo- rocking as an attempt to undermine all that those in charge think he represents. A Real Voice, uttered in the midst of the not-quite real Voice, you might say. 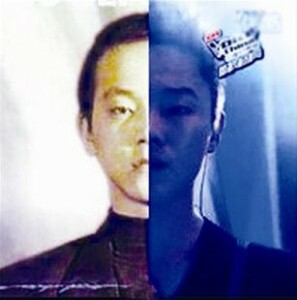 And the chatter that has popped up that sees Liang as resembling Dou Wei (see, left, via people.com.cn) – who most people watching The Voice would know not for his long yaogun and experimental career, but, rather, because of his former relationship with HK pop star Wang Fei (aka Faye Wong) in the late nineties. Liang (the right half of the image) and Dou are actually similar not only in appearance, but in the attitude for which most people would know them: stone-faced, intense, introverted and quite possibly angry (but only in Liang’s case is it ‘possibly’; we know Dou’s reputation for being something less than a happy camper). In the end, we’ll have to wait for Liang Bo’s debut before figuring out just what kind of Voice it is that he’ll develop.